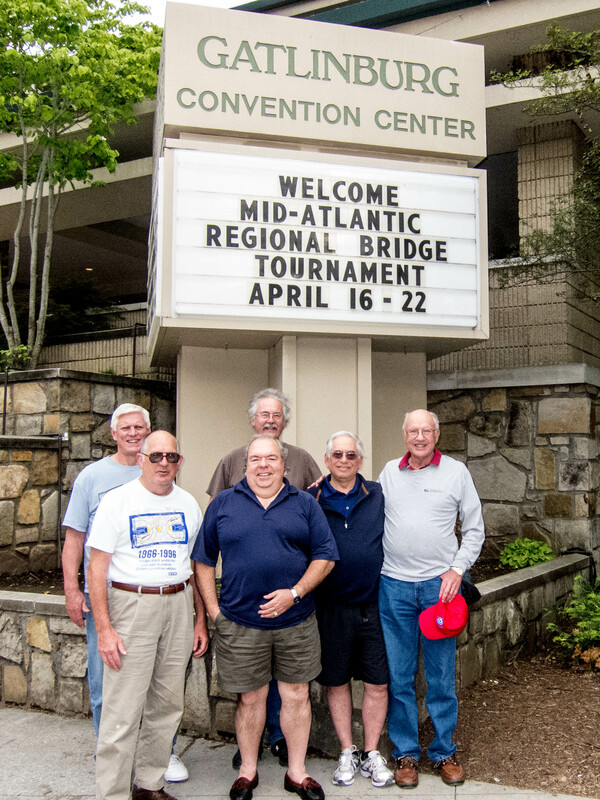 At most tournaments, Saturday is the big day. Around here, things are already winding down and closing up. Last night they were collecting the yellow bid boxes, because they go out today, just leaving the orange bid boxes. We’re not using the upstairs room anymore. People are starting to go home. And maybe we should have, too, since once again we won the first round of the KO and got beaten in the second. This time, it was more embarrassing than usual because there was a mix up, our bracket had 17 teams, and we had a round-robin in the second round, so we only had to beat one of two teams and we couldn’t do that, either. Lost both halves of the round robin and went home sadder, wiser, poorer and defeated. Today, we will begin the SIXTH KO event of the week in our quest to win something, anything, so our wives don’t spend all of the next 11 3/4 months laughing at us and asking why we bother to come here if we aren’t going to win. There was no morning team event today, so the athletic members of the group went on a nature walk. Danny and I, not the athletic types, drove over the Smoky Mountains to Cherokee, North Carolina (pronounced Calina by the locals) because we’ve seen all the tacky Gatlinburg has to offer and wanted some new tacky for a change. The drive is stunningly beautiful, through the Great Smoky Mountain National Forest. The road is wide and smooth and people actually drive the speed limit of 35, which is boring but lets you enjoy the vista. We went to Peter’s Pancakes, which is, it seems, the Holy Grail of pancake lovers. And this is definitely pancake country–there are at least 5 major pancake restaurants in Gatlinburg. "Hikers" pancakes, sausage and scrambled eggs. 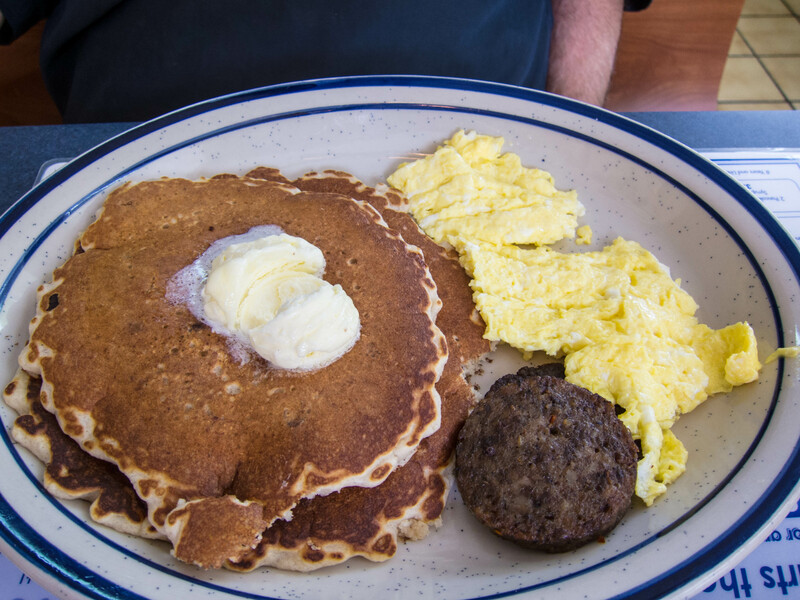 The hikers pancakes are made with multi-grain flour and nuts, the better to sustain the people who are in the process of hiking the entire Appalachian trail. Danny needs the extra energy to sustain his bidding. Biscuits and gravy and 2 eggs over easy. Very, very small eggs. When I went to UC Davis, there was a breakfast place we went to that offered 3 eggs on its breakfast dishes–then we found out they meant the tiniest little eggs you’ve ever seen. I think that their purchasing manager is working at Peters Pancakes, these were like robin’s eggs. 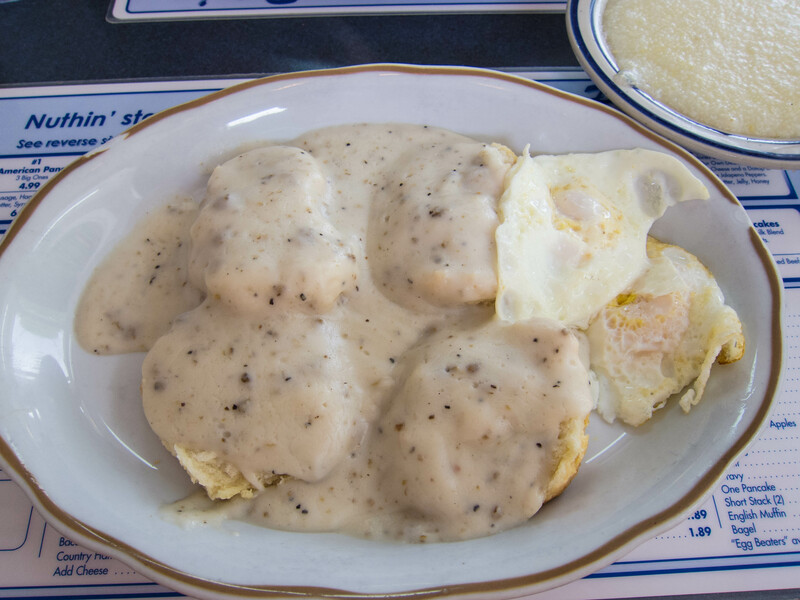 But the biscuits and gravy were classically wonderful, so it worked out. That's it. White mush. Gruel. 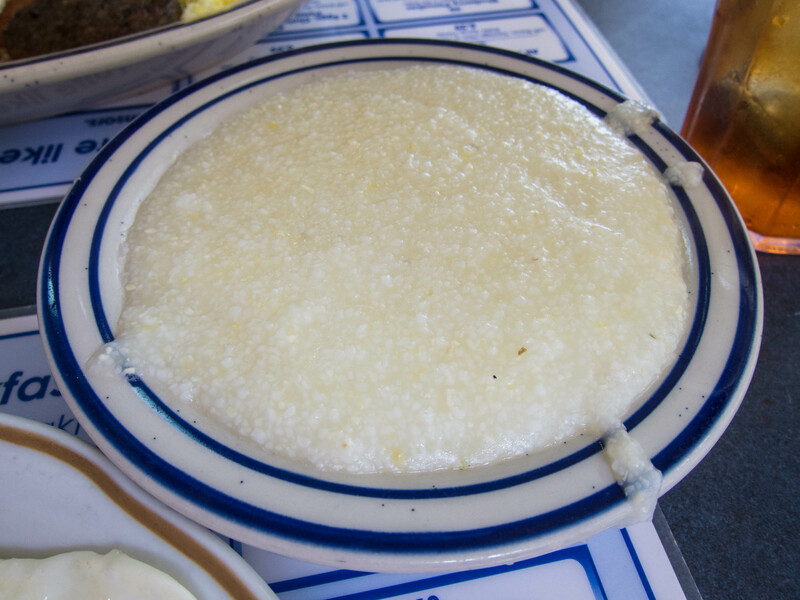 Grits, which have sustained the south for generations. 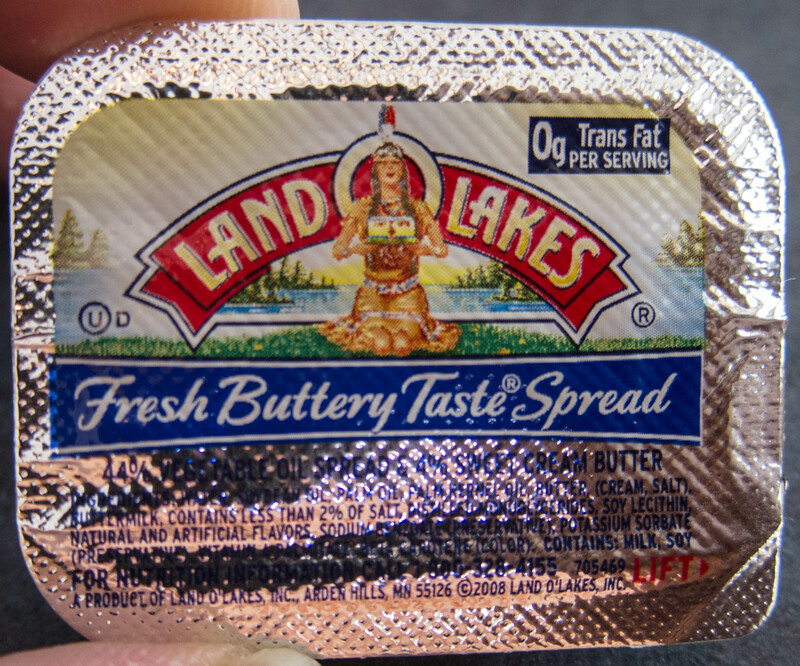 "Fresh Buttery Taste Spread" is another way of saying "yellow grease"
The Guide Michelin, doesn’t have a North Carolina edition, and Peter’s Pancakes may be the reason why. Last night we went to the Park Grill, one of the better places in town. I tried to explain to the group that if you have to wait for the restaurant to open, you’re way to damned early, but they’re all old men who would eat dinner at 4:30 if they could get into the place, so I went with them. The prime rib was fine, the sweet potato casserole was like dessert, the unsweetened iced tea kept flowing. What more could you ask for? 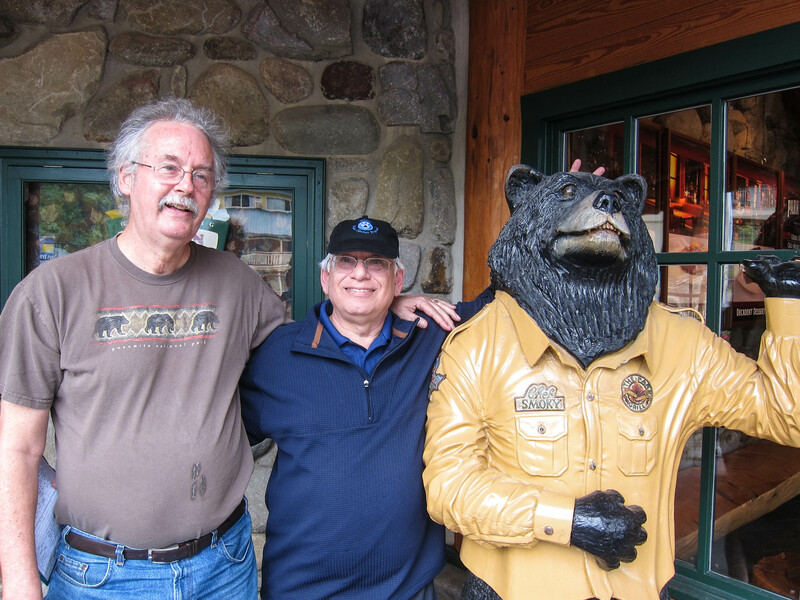 Bruce wants to point out that the bear was standing on a box Danny would be taller than it was. These guys confuse me. Finally, it’s time for the annual team photo. We asked a passer-by to take the shot, and he turned out to be a self-styled artiste, who spent too much time to get a simple shot. At least nobody has his eyes closed.